This past decade has been a decade of decline for the United States. The decisions we make now and the actions we take will determine the future of America and the American dream. Concerned citizens understand this but they have lost trust and confidence in their leaders, institutions, and the governing elite. They are searching for a resource to help them think about and respond to this situation. Renewing the American Dream is that resource. It provides a comprehensive analysis of the American condition using a unique three-part Renewal Framework, created by the authors. 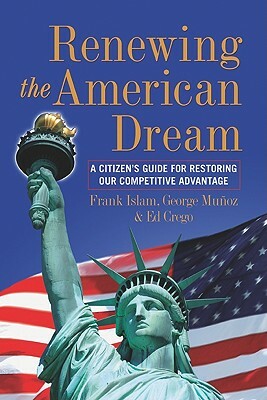 It frames the dimensions of America's current situation in holistic terms and brings the citizen's voice and the businessperson's perspective to the forefront in a national dialogue, which to this point has been dominated by elected officials, lobbyists, talk show hosts, academics, economists, and journalists. It can be seen as a twenty-first-century equivalent of Thomas Paine's Common Sense. The authors have lived the American dream and represent the diversity that is America. Frank Islam heads his own investment group and foundation and was the owner and CEO of the QSS Group, a highly successful information technology firm, which he sold to Perot Systems. George Munoz heads his own investment banking group and has been CFO of the United States Treasury and president and CEO of the Overseas Private Investment Corporation. Ed Crego heads his own management consulting firm and has worked with clients such as Motorola, John Deere, and the United States Departments of Labor and State.